Pioneering dance duo the Pet Shop Boys will be presented with an outstanding contribution to music award at next year's Brits, it has been announced. 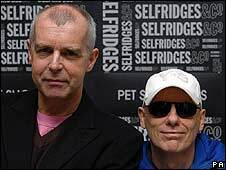 Neil Tennant and Chris Lowe, known for such hits as West End Girls and It's a Sin, will collect their honour at Earls Court in London on 18 February. Ged Doherty, the chairman of the Brits committee, called them "one of the most influential groups of the modern era." With 54-year-old Tennant on lead vocals and Lowe, 49, on keyboards, the Pet Shop Boys have had four number one singles and 22 Top 10 hits. Their first number one, West End Girls, topped charts all over the world in 1986 and won them the Brit Award for best British single. Their second Brit came in 1988 when they picked up the Best British Group award. "Since their first Brit Award over 20 years ago, Neil and Chris have produced a fantastic body of work with songs that truly were the soundtrack to a whole generation's lives," said Doherty. The nominations for the 2009 awards will be announced on 20 January.